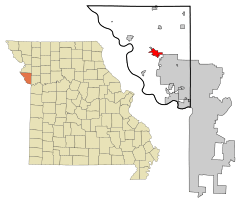 Platte City is a city in Platte County, Missouri, along the Little Platte River. The population was 4,691 at the 2010 census. It is the county seat of Platte County. 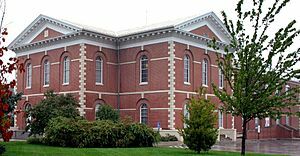 Platte County Courthouse in Platte City was built after the original courthouse was destroyed in the Burning of Platte City during the American Civil War. Blanche Barrow was held at the adjoining jail following a Bonnie & Clyde shootout just south of Platte City at the Red Crown Tourist Court. Platte City was founded by Zadock "Zed" Martin and was incorporated as a city in September 1843. On December 16, 1861, Colonel W. James Morgan's Union Squad razed Platte City, including the courthouse. The Platte County Fair held annually just outside Platte City began in 1863 and is the oldest continuously operating fair west of the Mississippi River. On April 3, 1882, Jesse James planned a robbery of the Platte City bank, but it was never carried out due to his assassination by Robert Ford on the morning of the raid. On July 19, 1933 Bonnie & Clyde were ambushed by, and engaged in, a shootout with local authorities just south of Platte City at the Red Crown Tourist Court. The Frederick Krause Mansion and Platte County Courthouse are listed on the National Register of Historic Places. Platte City is located at (39.361775, -94.774672). According to the United States Census Bureau, the city has a total area of 3.65 square miles (9.45 km2), of which, 3.61 square miles (9.35 km2) is land and 0.04 square miles (0.10 km2) is water. As of the census of 2010, there were 4,691 people, 1,975 households, and 1,174 families residing in the city. The population density was 1,299.4 inhabitants per square mile (501.7/km2). There were 2,214 housing units at an average density of 613.3 per square mile (236.8/km2). The racial makeup of the city was 88.9% White, 4.6% African American, 0.5% Native American, 1.4% Asian, 0.2% Pacific Islander, 1.6% from other races, and 2.9% from two or more races. Hispanic or Latino of any race were 4.9% of the population. There were 1,975 households of which 32.5% had children under the age of 18 living with them, 41.7% were married couples living together, 12.9% had a female householder with no husband present, 4.9% had a male householder with no wife present, and 40.6% were non-families. 34.9% of all households were made up of individuals and 9.3% had someone living alone who was 65 years of age or older. The average household size was 2.29 and the average family size was 2.97. The median age in the city was 35.2 years. 24.2% of residents were under the age of 18; 9.3% were between the ages of 18 and 24; 31.3% were from 25 to 44; 23.6% were from 45 to 64; and 11.6% were 65 years of age or older. The gender makeup of the city was 50.4% male and 49.6% female. As of the census of 2000, there were 3,866 people, 1,486 households, and 1,017 families residing in the city. The population density was 1,147.2 people per square mile (442.9/km²). There were 1,569 housing units at an average density of 465.6 per square mile (179.8/km²). The racial makeup of the city was 92.08% White, 3.34% African American, 0.49% Native American, 0.80% Asian, 1.16% from other races, and 2.12% from two or more races. Hispanic or Latino of any race were 2.79% of the population. There were 1,486 households out of which 37.1% had children under the age of 18 living with them, 51.7% were married couples living together, 12.5% had a female householder with no husband present, and 31.5% were non-families. 25.7% of all households were made up of individuals and 6.7% had someone living alone who was 65 years of age or older. The average household size was 2.48 and the average family size was 2.99. In the city, the population was spread out with 27.1% under the age of 18, 8.8% from 18 to 24, 34.6% from 25 to 44, 19.3% from 45 to 64, and 10.1% who were 65 years of age or older. The median age was 33 years. For every 100 females there were 99.1 males. For every 100 females age 18 and over, there were 94.4 males. The median income for a household in the city was $46,379, and the median income for a family was $52,548. Males had a median income of $36,563 versus $26,169 for females. The per capita income for the city was $20,288. About 4.8% of families and 6.2% of the population were below the poverty line, including 8.0% of those under age 18 and 9.2% of those age 65 or over. Interstate 29 at exit 18. Platte City, Missouri Facts for Kids. Kiddle Encyclopedia.